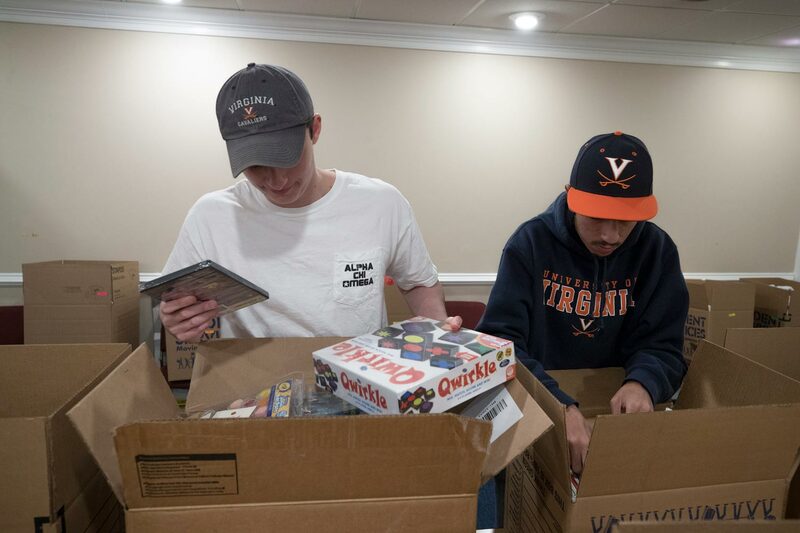 Assembling toys, checking off lists as gifts were delivered and filling boxes with clothes and other goods, University of Virginia student volunteers with the Holiday Sharing program were as busy as Santa’s elves last week as they prepared for Saturday’s festive distribution day. One of more than 20 community service programs of Madison House – the independent, nonprofit volunteer center for UVA students – Holiday Sharing annually partners with the Salvation Army to provide local, low-income families with food and presents to help make their holidays merry. This year, the program assisted 132 families, thanks to donations from hundreds of sponsors on Grounds and in the community. Organizations and individuals, UVA departments and offices were among this year’s donors. Another partner, the local nonprofit PB&J Fund, provided all the food – the equivalent of three meals for each family. “Distribution day is just one day, but it helps make many happy memories in the minds of children and their parents of the holiday season,” said Lauren Gronbeck, a fourth-year government major who serves as Holiday Sharing’s head program director. The families, some of whom were drawn this year from Madison House’s Big Siblings and Latinx and Migrant Aid programs, as well as the Salvation Army, visited Madison House’s Rugby Road location on Saturday in organized shifts. Children were occupied in one room with cookie decorating (UVA Dining donated the fixings), craft projects and UVA a cappella singing groups – plus a visit from Santa Claus. Meanwhile, volunteers helped parents and caretakers move each family’s packages to waiting vehicles. “Seeing the kids’ excitement is a terrific experience,” Gronbeck said. She also has heard parents express relief that the program will make holiday celebrations possible. Gronbeck, recruited by her older sister when she was a UVA student and program director, has worked with Holiday Sharing since her first year. Planning and preparation take the whole fall semester. Under Gronbeck’s leadership, six program directors and about 45 students worked with the Salvation Army to sign families up. They created new marketing tactics for marshaling the sponsors. This year they also set up tables on the Lawn to solicit individual student donors. Even as they faced end-of-semester academic deadlines, students put in five or more hours of preparation during the week leading up to distribution day. Albert Zeng, a third-year student in the McIntire School of Commerce, sat on the carpet, directions spread out as he screwed together pieces of a Big Wheel-style tricycle. He liked working at the Salvation Army and said he learned more about Charlottesville and the income gap here. When it comes to distribution day, though, it’s great to see the families; everyone’s happy, he said. Fellow McIntire student Mike Arbor, who volunteered with Holiday Sharing for the third time in his four years at UVA, also said he appreciated meeting families at the Salvation Army and enjoyed seeing the children’s faces light up in the festive atmosphere.